The Guardian 1300XL is Intervine's Latest Professional Series Tactical LED Flashlight combining the latest in LED lighting technology along with unsurpassed performance and capabilities. ✔ Tactical Tail Switch is now included along with the standard Luminescent Soft Button for Complete Versatility! The Guardian 1300XL comes with our Manufacturer 5 Year Warranty* and Amazing Customer Service! 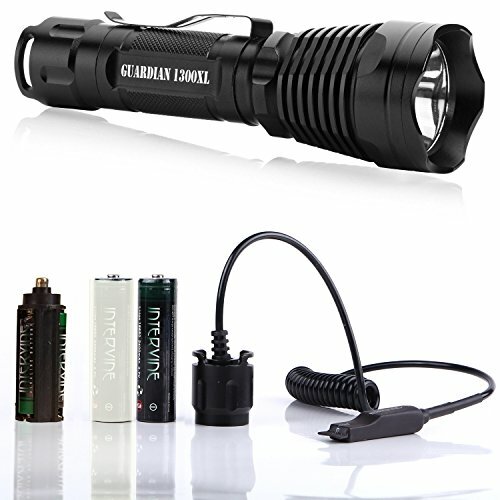 ILLUMINATION: Confidently navigate your way through the darkness with the Guardian 1300XL tactical flashlight. The intensity of the CREE XM-L U2 LED bulb generates a blazing brightness and a larger area of focus essential for police and military professionals. A stunning lighting distance of 300 yards (about 3 football fields), puts the spotlight on outdoor adventures whether you are camping, biking, hunting, hiking, or fishing.